Each year, research firm Gartner releases its Hype Cycle for Emerging Technologies, which is an exhaustive examination of more than 2,000 technologies and their present and potential impact on business use cases. The big question that the Hype Cycle looks at is not which technologies are most popular at the moment, but which technologies show promise in delivering a high degree of competitive advantage. The Hype Cycle takes a look at technologies at each stage of their development. The stages of the Hype Cycle, in order are: Innovation Trigger, Peak of Inflated Expectations, Trough of Disillusionment, Slope of Enlightenment and Plateau of Productivity. Let's take a quick look at which technologies are seeing their stock rise and what that might mean for your business going forward. Right now, it feels like every discussion about technology begins and ends with 5G. Sooner or later, it's going to impact every business and every individual in a significant way. Security, scalability, and speed should all be increased considerably. Though many service providers have announced plans to launch 5G services in the next year or two, Gartner reports that the majority of the applications through 2022 will be to primarily support IoT communications, high definition video and fixed wireless access. According to the Hype Cycle chart, 5G is not even halfway to its Peak of Inflated Expectations. With as many inflated expectations as we’ve seen displayed for this technology already, it’s incredible to think the expectations may get even more inflated. But with 5-10 years left until mainstream adoption, 5G still has a lot of growing up to do before it changes the way businesses operate. How will your business first use 5G? AI and Machine Learning are similar technologies that are currently at completely different points in the Hype Cycle. Though Machine Learning could be categorized as a type of Artificial Intelligence (AI), true AI has just entered the Innovation Trigger stage. Meanwhile, Machine Learning (and Deep Learning) are now moving past their Peak of Inflated Expectations. With Machine Learning and Deep Learning, the race is on for hyperscalers like Amazon, Apple, Baidu, Google, IBM, Microsoft, and Facebook to accumulate intellectual property that will define them as industry leaders. With products like Alexa, Siri, and Cortana already familiar to consumers and locked in a battle for space in our homes and devices, we are going to see even more development and adoption in this area. AI is not as developed, (widespread adoption is likely over 10 years away) but will be fascinating to watch as it matures. One of the major themes of the 2017 Hype Cycle for Emerging Technologies is why Enterprises should enable digital platforms. As more businesses move away from a siloed way of doing things toward more interconnected ecosystems, technology is evolving from compartmentalized pieces of infrastructure to platforms that enable multiple areas of a business. There is no doubt that large digital platforms like Uber and Amazon have transformed entire sectors of an industry, but even smaller organizations should be exploring how a digital platform could help their business grow and scale. Going forward, business leaders ought not get caught up in whichever technology is most hyped, but should think about how to create platform-based business models and focus on what technology is needed to support that move. Other potential technologies with this capability include IoT platforms, 5G, and quantum computing. 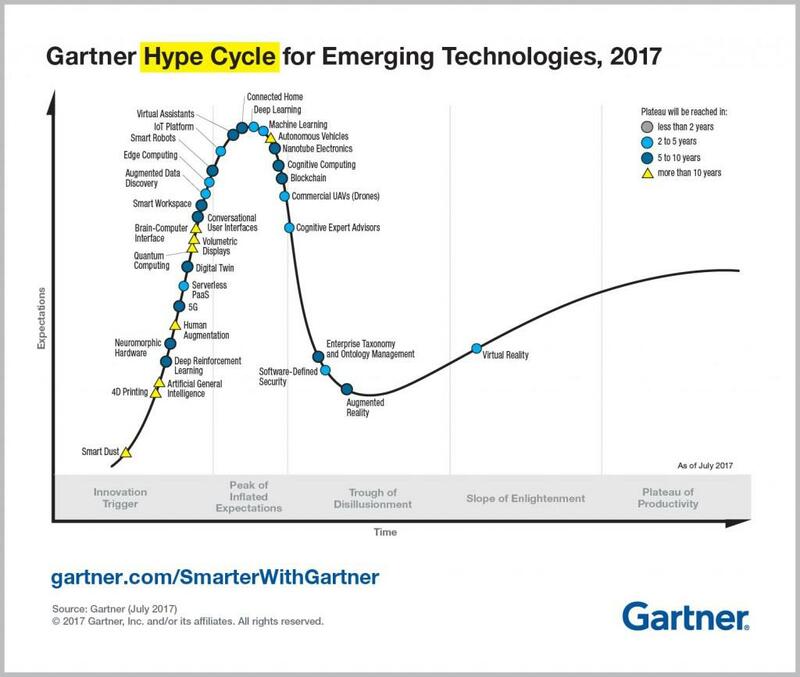 What's your take on this year's Gartner Hype Cycle for Emerging Technologies? Which technology do you think will make the biggest impact? Are there any technologies you think will disappear? We invite you to share this blog along with your thoughts on social media.